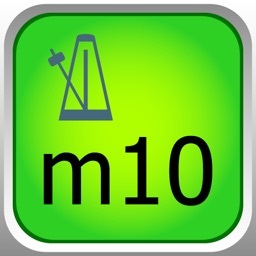 Subdivisions and programmable sequencer are included for programming mixed meters. Very accurate and capable for the professional musician. However, the user interface could be more intuitive. 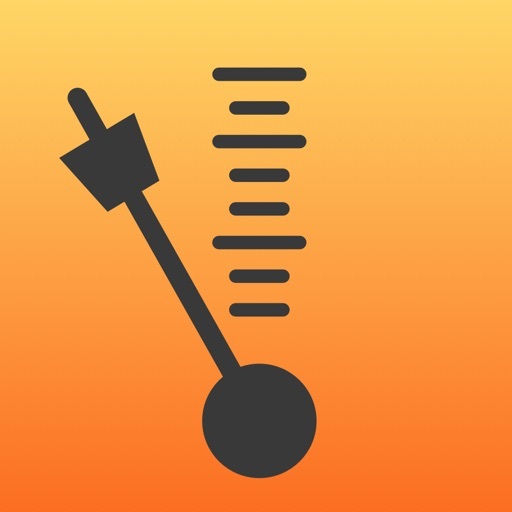 Featured as "New and Noteworthy" by Apple in March 2010, Metron is a popular and accurate metronome which has received great acclaim from amateurs and professionals alike. The brainchild of a classically trained musician, Metron aids in the practice of runs, excerpts and complete compositions. Featuring an intuitive front panel, you can launch and start practicing instantly, just like with any basic metronome. 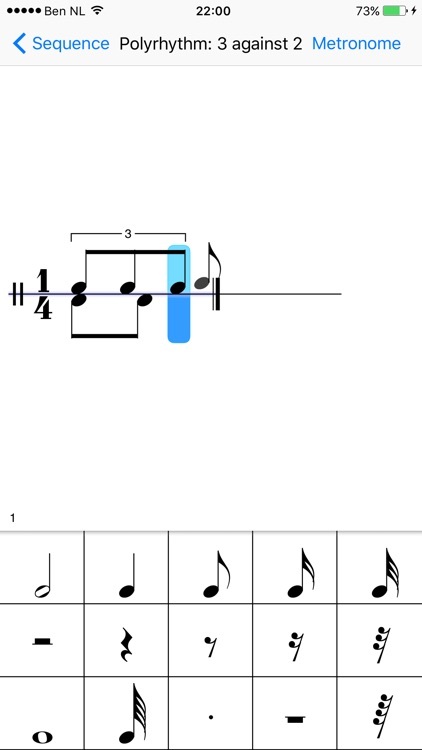 An organized back panel provides single tap access to an ample variety of commonly used time signatures, and also allows you to define new or edit existing sequences, with full access to its powerful and unique features. In addition to the usual single and multiple beat ticks of digital metronomes, Metron offers mixed time signatures with beat grouping and dynamic accellerando and ritardando through a high precision playback engine. A notation based sequencer offers detailed control over tempo and time signature changes, as well as allowing the creation of rhythmic patterns with individual beat sounds and volume control. You can even play two voices at once, so you can hear three against two or five against four, or more complicated polyrhythms. Metron also incorporates a pitch pipe that can be calibrated to the cent or Hertz. Demo clips and an extensive overview are available on our website. To visit it, click the link that follows this description. • Portrait and landscape mode. 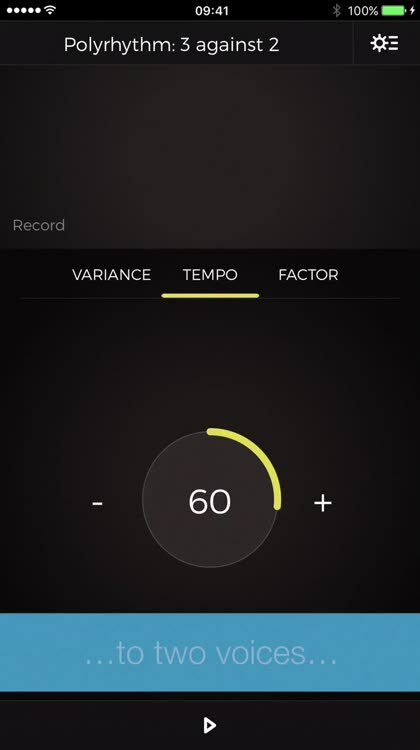 • Tempo from 1 to 999 Beats Per Minute nominally (effectively between 0.25 and 1998 bpm). 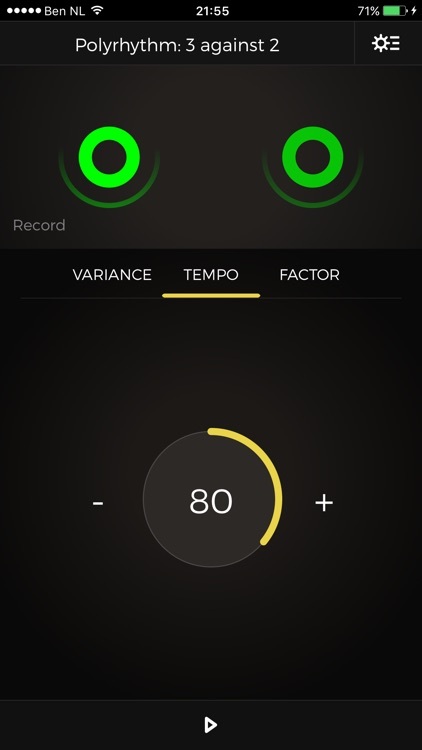 • Option to change tempo by traditional increments. • Accelerando and ritardando ("Variance"). • Polyrhythms (two voices at once). 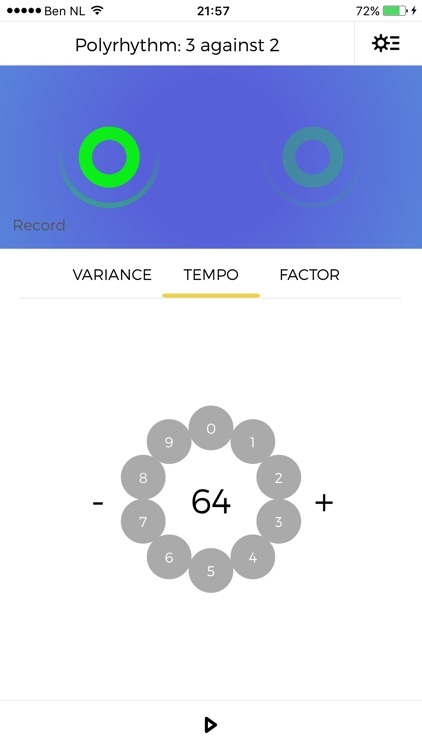 • Tap-pad to set the metronome tempo by tapping with a finger (e.g. by tapping to the currently playing song). • Accuracy: Samples are laid down with absolute accuracy. Any drift is inherent to the device Metron runs on. • Maintains accuracy when the screen is locked. • Optionally allow Metron to keep playing when switching to the background. • Record Metron sessions to audio files and share the recordings or the sequences themselves. • Navigate long sequences through rehearsal numbers. • Create your own library with any number of sequences. 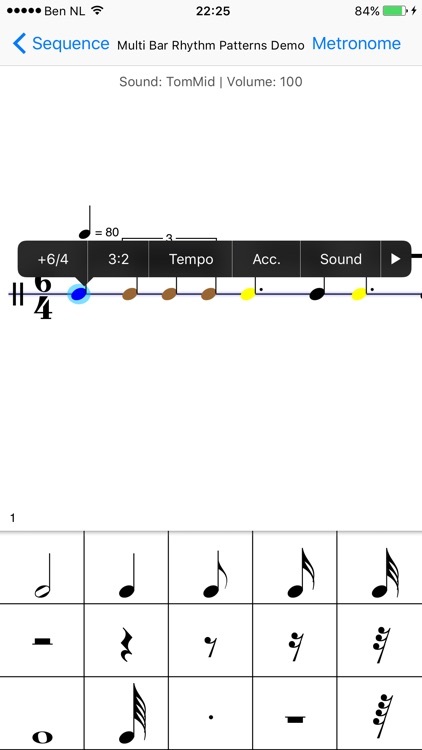 A set with the most commonly used time signatures is included by default. • Each sequence can set a countdown, and also whether the metronome stops at the end of the sequence or continuously repeats the sequence. You can also choose to have the countdown repeated with every repeat of the sequence. • Each bar consists of one or more time signatures and can set tempi and accelerando or ritardando on any beat. 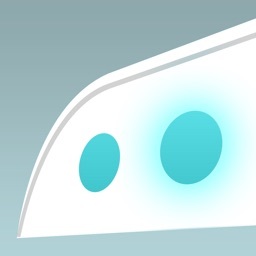 A bar can be set to play up to 200 times. • A time signature can have between 1 and 64 beats over a dotted or undotted denominator. 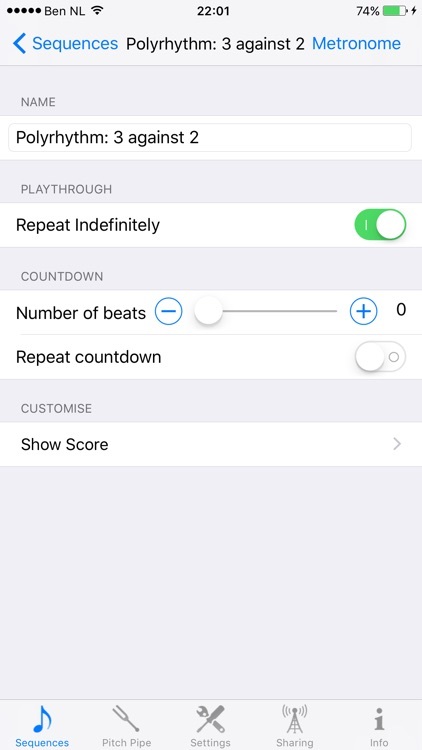 • A time signature can be subdivided into beat groups, allowing you to set an accent on any beat you wish, since grouping beats affects metronome playback. Metron differentiates between the first beat, stressed beats and unstressed beats, so you always know where in the bar you are. 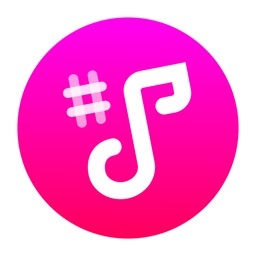 • Freely enter notes into bars to create rhythm patterns (like triplets or swing, or most any pattern you like). You can assign a custom color, sound and volume to any beat or any rhythmic component of a beat. You are in control. You can keep it as simple as you like, or make it as intricate as you need. 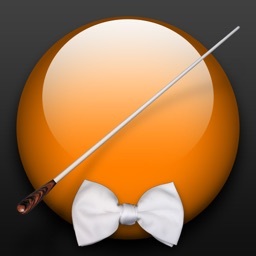 • Editing is done in a single staff score, with room for two voices, using traditional western music notation. 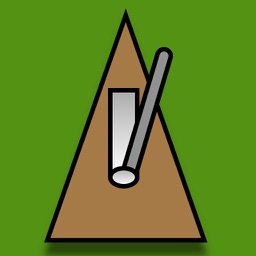 • Metronome includes a pitch pipe, that helps you tune your instrument. Easily choose any pitch within 9 octaves.